4/13/2009 — When my role as a statistic of the recession is over, I have a number of purchases I want to make. The MINI needs tires, the Vespa needs cowl guards, and I badly need a new helmet. My current lid is a $100 Fulmer Modus — good enough to keep my melon intact, but it’s heavy, LOUD, and starting to get frayed around the edges. I also want to make the switch from a modular (flip-up) full face helmet to a real full face with a fixed chin. They’re lighter, safer, and hear tell quieter. The trick has been finding one to fit my goofy head. Most motorcycle shops only carry one or two brands and rarely the full line of those brands. The thing is, you’ve got to put a helmet on your head to know if it fits. So the internet is useless for making an actual decision. So today I headed over to Bob’s Cycle Supply in St. Paul on the report that they have three of every helmet known to man. 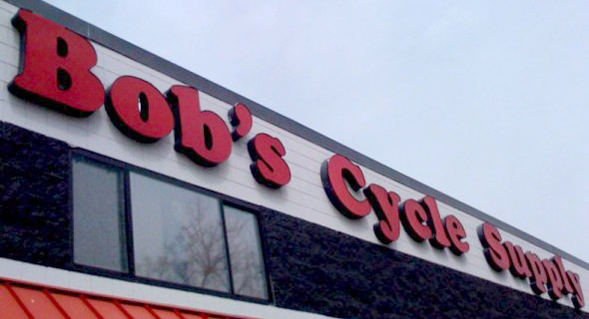 Bob’s is very close to the Como Zoo, so the ride route over was very similar to my ride over the weekend and took about an hour. Skies were overcast, but the temperature was great. The one thing I haven’t been able to shake though, is my leaning anxiety. After almost biffing it twice from the rear tire going randomly flat, I can’t seem to find the feel of the Vespa in corners. Compared to my former scooter, a Genuine Blur, my Vespa GT seems to almost scissor its way around corners. The rear end feels like it’s starting to drift out once I reach a certain angle of lean — and not a lot of lean, mind you. It wasn’t a big deal before the tire issues, but now I’m having trouble committing to a deep lean. I suspect it may actually be the tire tread pattern though and I just need to get out there, get the ol’ boy leaned over, and get over it. Once at Bob’s the helmet shopping began. I started with Scorpion and their $290 EXO-1000 series helmet. These are nice because they include an internal flip-down sunshield. Tried XL and XXL and the fit of the XXL was decent, although not wow. I moved through HJC, Fulmer, KBC, and other brands that ranged from passable to downright uncomfortable. So far the Scorpion was the front runner. Then I came to the Arai display and against my better judgement slipped an XXL Arai Vector onto my noggin. It fit perfectly, which was awful. The Arai Vector is a $420 helmet. I got lucky though. I returned to the Scorpion display to see if the velvety bliss that is the inside of the Arai was really worth the $130 difference in price over the Scorpion. Picking up what I thought was an EXO-1000, I actually picked up an XXL Scorpion EXO-700. I slipped it on my head and it felt remarkably like the Arai — I’d say about 90% the comfort, fit and materials quality, but for $199. Win! For good measure, I tired on the EXO-1000 one more time and the fit just wasn’t good at all in comparison. Who would have thought the cheaper lid with fewer features would be the better helmet? Finding an affordable helmet that fits great and has lots of great accessories available. Also spending time on the shores of Lake Nakomis. Having three near-misses with people pulling out in front of me. If I hadn’t been Johny-on-the-spot with my horn, those situations could have been much worse. Thankfully a quick little “meep meep” got their attention enough to stop them in their tracks.